Wow, the weather was beautiful here today!! Yes, it was February 1, and I was outside, barefoot, in short sleeves, spray painting. Perfection. We recently moved into a tiny two bedroom apartment. I used to have five bedrooms in an 1800 square foot house, so I had one large sized bedroom devoted solely to crafts/office space. In our new, much smaller, yet closer to everything, and cheaper house, the living room now has five functions: living room, play room, music room, office, craft room. I'm super grateful for our affordable housing, but I really hate the look of so many pieces of furniture crammed into one space and pushed up against walls. And there is just really no way around clutter. I'm fighting the battle, but losing. 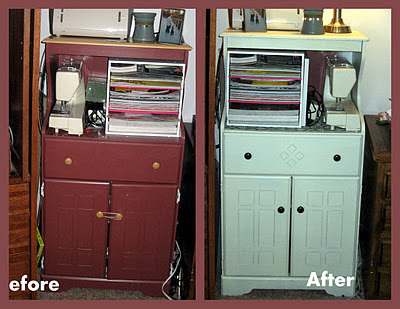 After we got settled in and I realized that I needed some craft storage in the living room, but had no money to spend. Within a week, I found this beaut on the side of the road! (It's the cabinet squeezed between the desk and the armoire, behind the little Elmo lover.) Don't you just love its plum color? Today, my little craft corner got a makeover!! For $8 I picked up two cans of Krylon Satin Ivory spray paint (although I probably should have had three cans). The sun came out and I hauled this road side piece of country junk out to the patio. I used the method of spraying that my Mama taught me - short and quick strokes, several thin layers. I did 3.5 layers, but honestly should have done 4. This is after the first coat, obviously before I got my groove going. The simple wooden knobs were given two coats of oil rubbed bronze spray paint. I love the way they glisten in the sun - too bad my cave of a house doesn't get sunshine like this! After the paint dried, I scuffed up the edges, and some of the plum showed through. Not exactly what i was going for, but I kind of like it! I think I'd like to replace the o.r.b. knobs with some teal glass or ceramic ones from Hobby Lobby. I didn't paint the interior part of the open section because I'd like to put contact paper on the back and sides. One of the benefits of the craft cabinet being squeezed in between two other pieces of (major) furniture is that even though I ran out of spray paint, who cares! I conserved the majority of the paint for the front and tops that are actually visable. If we ever move and this piece of furniture is more prominent, I will just grab another can of spray paint and touch it up. Can you see how the bottom half of the side could use another coat or two? Levi loves getting in this cabinet, so I invested in some really high end baby-proofing. And here are some gratuitous shots of the inside of my craft cabinet. I attached a 3M hook to the left side of the cabinet to hang extra wreath forms and other things that don't fit inside the cabinet that can be hung, like my quilter's cutting mat and plastic guide (what are they really called, mom?). 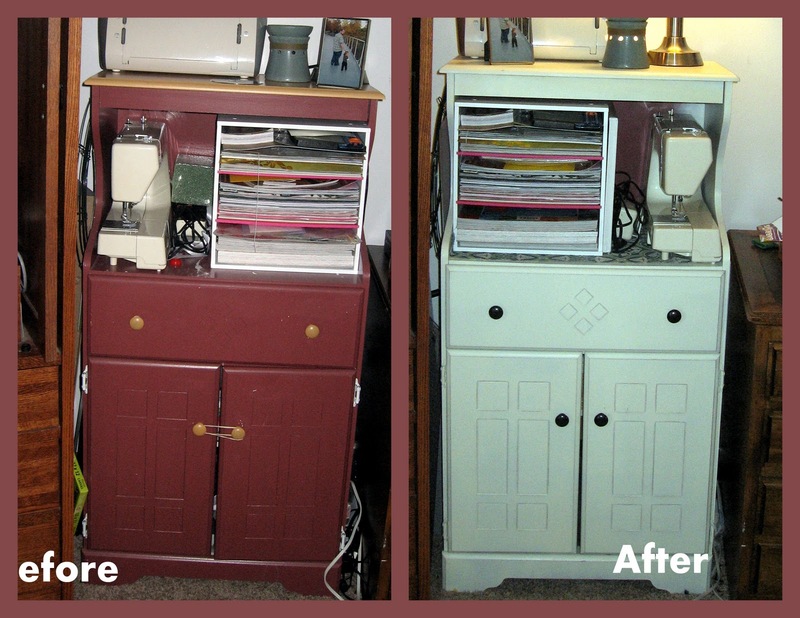 And that's the story of how I shrunk all my crafts from a bedroom space to a cabinet. Well, let's be fair, some of my fabric and sewing notions live on top of the TV cabinet. See, I told you, clutter everywhere! Boy, this looks way worse in the picture than it feel in real life. Oh, and notice the parson desk chair? I think I promised you the 25 part saga - let's get to that this week, mmmkay? love it! krylon ivory breeds in my craft closet. Seriously.